Native to South Africa, these clump forming succulent plants have similarities with the Aloe plants and they’re related with the same subfamily. There are also subspecies grown. In their natural habitat (subtropical) Zebra Plants receive plenty of sun and periods without rainfall. Their succulent nature enables them to store water within the thick leaves when there’s no frequent rainfall. 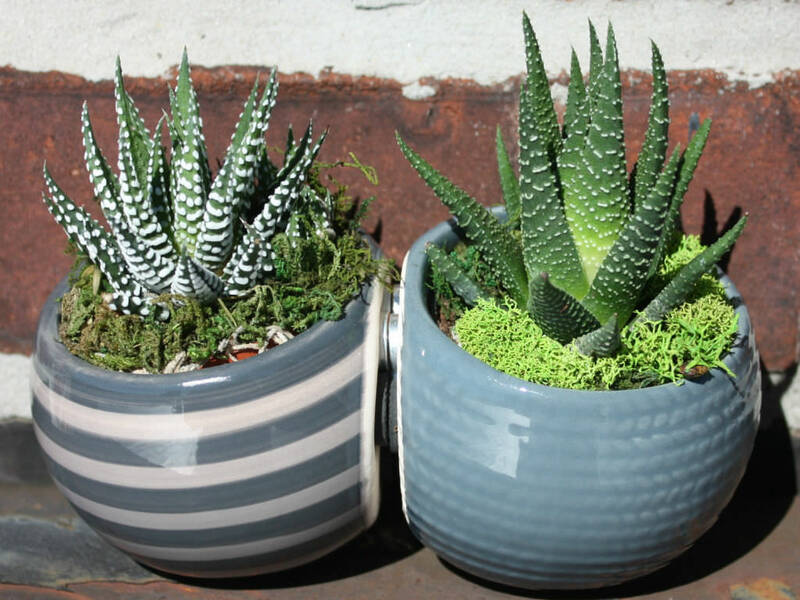 The main difference between the two species (Haworthia fasciata and Haworthiopsis attenuata, formerly known as Haworthia attenuata) is the Haworthia fasciata has smoother inner leaves unlike the Haworthiopsis attenuata that displays tubercles (warty growths). The “fasciata” is supposedly more rarer than the “attenuata” and seems to have fatter leaves. Primarily they are grown in gardens. However, they are also grown in greenhouses, conservatories and within homes. Flowering: If the Zebra Plant blooms appear (may not indoors) they are small tubular white or pink flowers growing from an inflorescence (thin kind of stem). Foliage: The Zebra Plant forms a rosette of leaves. These leaves are very thick and patterned with Zebra like white stripes or tubercles that look like warts. They’re a clump forming plant in the wild so they can be grown with several or as many as you like in one container. Temperature: 65°F – 80°F (8°C – 26°C) temperatures are very good and not much below 50°F (10°C). Light: Display Zebra Plant anywhere it can receive plenty of sun or bright light. South facing windows will provide the most sun, however, east or west provide direct sun part of the day that I find more suitable. Water: During the growing season from April to September water the Zebra Plant thoroughly and then water when the soil becomes dry to the touch (not bone dry though). Winter is a tricky time for these plants although they are a tough species. Many growers will overwater then alongside cold temperatures or drafts the plant can become very sick, or even die. The leaves are storage organs so during the winter water much less and allow the top soil to dry out. Soil: Use a cactus potting mix that drains wells and provides plenty of air to the small roots. If making you own mix or buying another type, use part potting soil, part perlite and part sand. Air Humidity: Normal room humidity will suffice. Fertilizer: From April to September you can feed Zebra Plants with a diluted liquid fertilizer once every month. Do not feed during winter. Once the Zebra Plant outgrows the pot you can repot, during spring. Only move to a slightly bigger pot. Every two years I would renew the soil even if repotting is not required. Zebra Plants are propagated in the same way as Aloe plants. Propagate with a couple of inches of leaves, letting the wound heal for a couple of days before planting (let them dry out). They also produce pups (offsets) that can be removed from the mother plant and replanted. Either method you should water the soil once and then wait to see a small sign of new growth to prevent killing them with overwatering.